Introduction: Home mechanical ventilation (HMV) represents a standard of care for ventilatory pump failure. The standard of care could be a determinant of deficiencies in the quality control of the treatment. Materials and Methods: In order to monitor compliance during home mechanical ventilation and optimize its effectiveness, we proposed a program through a day hospital conducted by pulmonologists and respiratory physiotherapists. A descriptive study was designed basing on a systematic collection database. Participants were consecutive patients with noninvasive ventilation or invasive mechanical respiratory assistance treated in the Pulmonology Service between July 2014 and December 2016. Results: 94 patients were included: 52 men (55%), age 64.4 ± 15.9 years, where 50% were obese or overweight (body mass index of 28.6 ± 8.46 kg / m2). 80 patients (84%) received home mechanical ventilation: noninvasive in 77 cases and invasive in three cases (4%). 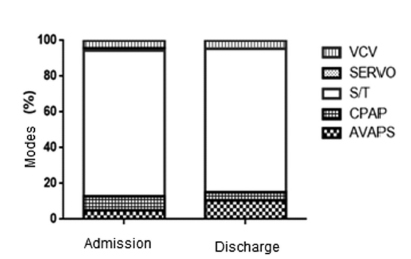 14 patients (14.8%) were admitted to evaluate the indication of home mechanical ventilation. The following noninvasive ventilation modes were used: Bilevel S/T, 59 (62.7%); average volume-assured pressure support ventilation (AVAPS), 4 (4.2%); continuous positive airway pressure (CPAP), 6 (6.4%); servo-ventilation, 1 (1%). Three patients received volumetric ventilation. Mean compliance was 8.1 hours. Four patients did not use the device. 42.5% of patients remained hypercapnic. The setting was changed in 37 patients (46.2%), ventilatory mode was set in 2 (2.5%) and ventilation was suspended in two (2.5%). Adjustments in individual patients were clinically significant. Conclusion: This program let us improve training and identify a high percentage of patients with ineffective home mechanical ventilation, allowing for adjustments in the modality of treatment. Key words: Home ventilation; Noninvasive ventilation; Monitoring. Home mechanical ventilation (HMV) consists in the intermittent or continuous use of a ventilation system administered through an interface: nasal, facial interfaces or mouthpieces for noninvasive ventilation, or tracheotomy for invasive ventilation1. This modality of treatment is used for chronic respiratory failure with the purpose of reducing dyspnea, relieving the work of respiratory muscles and correcting hypoxemia and hypercapnia and consequent respiratory acidosis, improving alveolar ventilation and gas exchange1-3. Long-term home ventilation represents a standard of care for patients with chronic ventilatory pump failure2, 3, improving the survival of patients with neuromuscular and chest wall diseases4-8 and also the quality of sleep and quality of life of patients with obesity hypoventilation syndrome8-10. In patients with stable hypercapnic chronic obstructive pulmonary disease (COPD), the role of home ventilation is still controversial, though recent contributions to the scientific community seem to show an improvement in survival11 and a reduction in exacerbations and hospital readmissions12-13. This modality of treatment was highly developed in Europe and, though it is used differently according to each country, the average use exceeds 10 treatments every 100.000 inhabitants14-18. Some studies have shown the deficiencies in the quality control of home noninvasive ventilation systems, mainly when there are no multidisciplinary teams and the monitoring is almost exclusively handled by the technical staff of service rendering companies, thus exposing the low participation of prescribers and health centers in the quality supervision of the treatment and equipment18, 19. However, the HMV has extended and its growth can even be observed in our area. The information provided by a center of the city of Buenos Aires explains the profile of indications and characteristics of the patients20, though the lack of a registry in Argentina prevents us from having access to updated data. Also, we do not have objective information regarding HMV compliance or efficacy monitoring. Often, the home care model could be determinant for patients to lose contact with reference specialists after hospital discharge20, 21. On the other hand, difficulties in movement, the need for complex transportation, architectural barriers that limit the access of patients and the need to run supplementary tests (analytical lab, blood gas tests, specific ventilator software, availability of respiratory functional tests, etc.) obstruct the outpatient consultation with the specialist, often forcing readmission of patients with noninvasive ventilation (NIV) and of those who require invasive mechanical respiratory assistance (IMRA). In order to monitor ventilation treatment compliance and optimize its effectiveness, we proposed a program to improve the connection between patients with chronic home ventilation and the reference hospital by means of a day hospital system (Respiratory Observation Unit, ROU). The purposes of our study were to describe the characteristics of patients receiving some sort of chronic home ventilation in a community hospital; to know objective data about the effectiveness of ventilation and to evaluate the feasibility of the procedures in a day hospital model in patients with HMV. A descriptive study was designed basing on a systematic collection database in a single university center. The participants were consecutive patients with NIV or IMRA treated in the Pulmonology Service between July 2014 and December 2016. Those who were indicated with some ventilation modality during their hospital stay were asked to be part of the ROU four weeks after hospital discharge. Information was obtained from the medical records of patients in whom any modality of HMV was indicated during their participation in the ROU program of the Hospital Británico de la Ciudad Autónoma de Buenos Aires (Argentina). Demographic and anthropometric data, clinical history, diagnoses and reasons for indication of NIV were recorded. The following physiologic measurements were taken: gases in arterial blood (in the morning, in sitting posture and vigil without using ventilation equipment or supplementary O2) and computed spirometry with flow-volume curve (MedGraphics. USA). According to the FEV1/FVC (Forced Expiratory Volume in First Second/Forced Vital Capacity) quotient < Lower Limit of Normal (LLN), spirometries were classified in obstructive patterns (quotient < LLN and FEV1 < 80% of the predicted value) or non-obstructive patterns (quotient > LLN). The ventilator mode and settings were recorded at the Unit’s admission and discharge, and data from the internal software of the ventilators were downloaded using Encore II and Direct View (Philips- Respironics. USA) or ResScan (ResMed. Australia). When necessary, ventilation and oxygen therapy settings were adjusted. We controlled the patients’ material, their education, and their families’ education. The ROU program was developed inside the hospital area during a 4-6 hour module in the morning, in the sleep laboratory (the area where night polysomnographic records are performed). Statistical Analysis. Results were presented as percentages for the categorical variables or as mean and standard deviation for the numerical variables. To compare differences between two groups we used the Mann Withney Test or χ2 for quantitative and qualitative variables, respectively, and to compare the results of three or more groups we used the Kruskall Wallis Non-Parametric Test and also the Dunn’s Multiple Comparison Test. Data analysis was performed with the Prism 5 software (Graph Pad, La Jolla, CA). For 30 months, 94 patients were included in the ROU program: 52 men (55%), mean age 64.4 ± 15.9 years (percentile 25-75%: 50-74) and Body Mass Index (BMI) of 28.6 ± 8.46 kg/m2. Table 1 summarizes the clinical-demographic characteristics of the population. At the time of the study, 55 patients had been smokers (58.5%) and 6 were still smoking (6.4%). 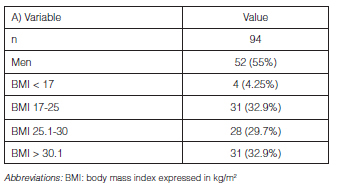 31 patients were obese (BMI > 30); distribution according to the BMI is shown in Table 2. 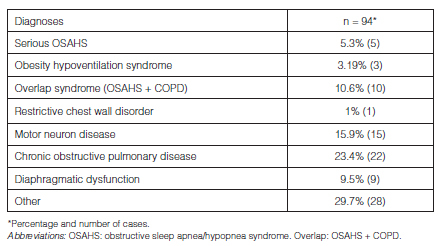 We observed that 50% of patients were obese or overweight, being the diagnoses of obstructive sleep apnea/hypopnea syndrome (OSAHS) and diaphragmatic dysfunction predominant in those patients. The main diagnoses were: motor neuron disease (n = 15; 15.9%), COPD (n = 22; 23.4%), overlap syndrome (OSAHS/COPD) (n = 10; 10.6%), OSAHS (n = 5; 5.3%), diaphragmatic dysfunction (n = 9; 9.5%), restrictive chest wall disease (n = 1; 1%), central alveolar hypoventilation (n = 1; 1%). In 28 patients (29.7%), other causes were detected (West syndrome, cystic fibrosis, olivopontocerebellar atrophy, Charcot Marie Tooth syndrome, polyneuropathy of the critically ill patient, interstitial pneumonitis) (Table 3). Eighty patients (84%) were receiving HMV when they started the ROU program, as NIV in 77 cases and by tracheotomy IMRA in three cases (4%). Finally, 14 patients (14.8%) were admitted to evaluate the indication of long-term home NIV. 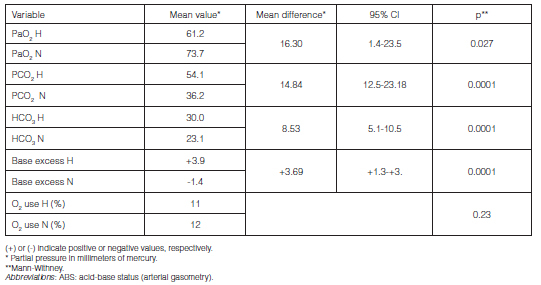 Data from the respiratory functional tests are detailed in Table 4. In 53 patients with NIV we assessed the respiratory indicators of the polysomnography (PSG) or respiratory polygraphy (RP), shown in Table 5. We used the following NIV modalities: bilevel S/T (spontaneous/timed) mode, 59 (62.7%); presometric average volume-assured pressure support (AVAPS): 4 (4.2%); continuous positive airway pressure (CPAP): 6 (6.4%); servo-ventilation: 1 (1%). Three patients were receiving volumetric ventilation in controlled, assisted mode. We used nasal masks, 10 (12.6%); nose and mouth masks, 62 (82.6%); total face masks, 2 (2.1%) and tracheotomy cannulas, 3 (4%). Twenty three patients (24.4%) used supplementary O2 from a stationary source by means of an O2 concentrator. The mean objective compliance hours (data download from built-in software) of the NIV was 8.1 hours (P25-75: 4.3-9.4). Four patients were not using the device, though they had the indication to use it and the proper equipment. The mean expiratory positive airway pressure (EPAP) was 6.6 cm of H2O and the inspiratory positive airway pressure (IPAP) was 16.3 cm of H2O. The analysis of the population with NIV as a whole showed there were no significant changes in the mean values of the parameters under study (Figures 1 C and D) before and after the evaluation at the ROU (p > 0.5). 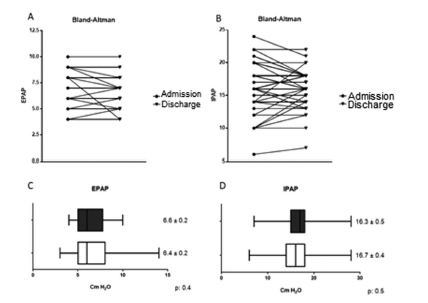 However, in individual patients, adjustments after the analysis of ventilator software data were clinically significant (Figure 1 A and B). After the evaluation, the settings were changed in 37 patients (46.2%), ventilatory mode was set in 2 (2.5%) and ventilation was suspended in two cases (2.5%) (Figure 2). Figure 2. Changes in ventilatory mode at the ROU Abbreviations: VCV: volume-controlled ventilation. SERVO: adaptive servo-ventilation. S/T: presometric time-cycled or spontaneous mode (Spontaneous-Timed). CPAP: continuous positive airway pressure. AVAPS: average volume-assured pressure support. Morning arterial gasometry, vigil and in sitting posture with 0.21% FIO2 in patients with NIV showed (mean values and standard deviation): pH, 7.38 ± 0.04; PaO2, 66.2 ± 25.4 mmHg; PaCO2, 43.5 ± 15.6 mmHg; HCO3, 25.2 ± 7.8 mmHg. The alterations in the respiratory functional test were related to increased hypoxemia and hypercapnia (Table 6). Forty patients with NIV (42.5%) remained hypercapnic (PaCO2 > 45). They also presented a higher degree of hypoxemia and a greater alkaline reserve (Table 7). The most frequently used procedures at the day hospital were: arterial gasometry and acid-base status (91.4%), computed spirometry (87%), download of memory data from the mechanical ventilator (built-in software) (78%), alternative, contingency plan (79.7%), classic and cough peak flow (18%), inter-consultation with other specialists (16%), end-of-life decision-making or anticipated instructions with the patient and his/her family (21%), assisted cough training with the air stacking technique (18%), guidelines of the kinesics plan (10.6%), diffusing capacity of the lungs for carbon monoxide (DLCO) (8.5%), analytical lab (8.5%), chest X-ray (7.4%), changing of tracheotomy cannula (2.1%) and mouthpiece ventilation training (2.12%). This study shows the complexity of the management of patients with HMV in a day hospital program. Our population was heterogeneous, showing the importance of the specialist in respiratory medicine and the versatility of home ventilation for a broad spectrum of diseases. Also, the high proportion of comorbidities and the alterations in the pulmonary lung tests justify the work of a multidisciplinary team. Sleep-related diseases and COPD predominated in middle-aged, obese patients; in subjects with normal or low weight, neuromuscular diseases were more frequent. Despite the fact that these diseases compromise ventilation, only 56% had a sleep study available, which turned out to be pathologic in all the cases2, 21, 22. The NIV techniques have made great progress in the treatment of chronic respiratory failure of restrictive origin. The available results show that NIV improves quality of life, increases survival, and improves gas exchange and quality of sleep. Nowadays, there is a well-established indication of NIV for neuromuscular diseases, defects in the chest wall, sequelae of tuberculosis or surgeries, obesity hypoventilation syndrome and other alveolar hypoventilation syndromes1-10. In our series, this type of patients represented 44% of the sample. Patients usually go through the period of adaptation to NIV during a scheduled hospital admission11, 23, though it has been described that it may also be carried out successfully in day hospitals24. Probably it is not the place of the adaptation what matters the most, but the motivation, experience and commitment of the staff24. In our series, 15 patients (16% of the whole population) were admitted to evaluate the long-term use indication and begin adaptation to home NIV. NIV compliance is directly proportional to the perception of improvement, to educational interventions in the patients and his/her environment, to the regularity of follow-up and the availability of the treating team and service provider for the practical resolution of problems that could arise during treatment. In our experience, four patients did not comply with treatment, though most of them showed an acceptable compliance level, with a mean value of 8.1 hours/day. It is important to mention that treatment compliance was documented by means of the memory inside ventilators devices and not from patients’ self-reported information, which frequently lead to overestimation24. The formal review of the compliance information and usage profile of the equipment must be a routine semiologic element during the clinical examination of the patient receiving HMV treatment, when this resource is available24-25. The monitoring of HMV efficacy must include, as a minimum, an evaluation of the clinical improvement and a measurable assessment of the ventilation objectives (correction or improvement of day pattern of blood gases, oxygenation and night ventilation), but it shall also ensure a good patient-ventilator synchrony, with no abnormal events. Thus, the inefficacy of NIV may be reflected both on a clinical level (no improvement) and on a gasometric level (persistence of hypercapnia) or on the instrumental level (built-in software or unsatisfactory PSG/RP with NIV). It is important to acknowledge the changing condition of most diseases that require HMV treatment. In this regard, some diseases may relentlessly be progressive, thus requiring permanent adjustments. As described in other countries, the presometric modes were most frequently used for NIV, and the volumetric modes were mostly used for invasive HMV. In this regard, the S/T mode was preferred, and after the visit, 2.5% of patients changed the ventilation mode. The download and analysis of objective data allowed for significant adjustments in some cases, something that hadn’t been previously noticed. However, our work only describes interventions and objective findings of a scheduled visit to the ROU. So, the usefulness of such interventions in time has not been assessed, and this is a limitation to our analysis. We found a relationship between the degree of commitment of the lung function evaluated by spirometry and the magnitude of the gasometric disorders. Both defects indicative of restriction and the obstructive-type defects were related to increased hypercapnia and an increase in the alkaline reserve, even in patients with HMV. In this regard, it is remarkable that although they were receiving HMV, 40% of patients remained with some degree of hypercapnia. Our work does not compare gasometric changes in a longitudinal manner in this cohort, but this information compels us to review the HMV procedure, since the gasometry represents a treatment objective. It has been described that it is possible that in some diseases (mainly in COPD), one of the HMV objectives is improvement (not normalization) of the CO2 values and pH as an efficacy surrogate of ventilation11, 26. Material control is essential in every visit. HMV providers and financiers must make the commitment to ensure the proper delivery of the necessary material in optimum working conditions, according to the needs of each patient. In turn, the treating team is responsible for cooperating with the maintenance of the material and ensuring that the patient and his/her environment acquire the minimum abilities to guarantee the suitable care of the devices and accessories. Finally, end-of-life decisions are a complex aspect of the chronic care that requires time, a suitable training and the proper space. The integral management of patients with advanced COPD or progressive neuromuscular diseases frequently requires an integral approach from the multidisciplinary team27. The suitable management of the information and thorough knowledge of the patient’s preferences result in an adaptation of the care system to his/her needs24-27. In our experience, the ROU has enabled a relaxed environment to improve training in HMV techniques and discuss treatment options, different from that regularly offered at the hospital ward, the emergency department or the outpatient area, allowing for the contact of the patient and his/her family with specialists in the management of respiratory care. Finally, initiatives like this may improve the contact of young physicians and physiotherapists in training with patients with complex diseases, working as a team, increasing the profitability of the Sleep Unit that has unused beds during the day that could be used for monitoring ventilated patients. Limitations: Our day hospital modality was limited to only one center. The heterogeneity of the diseases that motivated chronic ventilation, the type of coverage system and also geographical and social factors complicate the extrapolation to other populations. In addition, we evaluate patients in only one visit for a short period after hospital discharge. Long-term follow-up is necessary in order to assess the usefulness of this type of strategies. The implementation of the ROU program improved the connection of the patient and his/her family with the treating team and enabled the identification of a high percentage of patients with ineffective HMV, allowing for adjustments in the treatment modality. Longitudinal studies are necessary to evaluate the long-term impact of this type of interventions. 17. Data from the Antadir French Observatory. Available at: http://observatoritrd.weebly.com/uploads/5/1/4/2/5142345/antadir_2010.pdf. Consulted on 4-23-2016.